Product information "CBX1 (human recombinant)"
The heterochromatin protein 1 (HP1) family, which consists of three isoforms HP1alpha (CBX5), HP1beta (CBX1), and HP1gamma (CBX3) are chromatin-associated proteins involved in gene regulation and heterochromatin formation. CBX proteins have an N-terminal chromodomain, a C-terminal chromoshadow domain (CSD), and a hinge domain which connects the two. Extensive post-translational modifications have been observed and mapped on the CBX proteins. The chromodomain of CBX1 has been shown to recognize di- and tri-methylated lysine 9 on histone H3 (H3K9me2 and H3K9me3), with a preference for H3K9me3. Binding of CBX1 to methylated histones leads to gene silencing and heterochromatin formation. The CSD region of CBX1 is responsible for homodimerization and interaction with a number of non-histone chromatin-associated proteins, including the BRCA2-interacting protein EMSY, which may be involved in the development of breast and ovarian cancer. CBX1 also helps to reorganize chromatin as part of the DNA damage response systems by binding to sites of DNA damage through the CSD region. Our products are for laboratory research use only: Not for administration to humans! Log in or register to request a certificate of analysis. 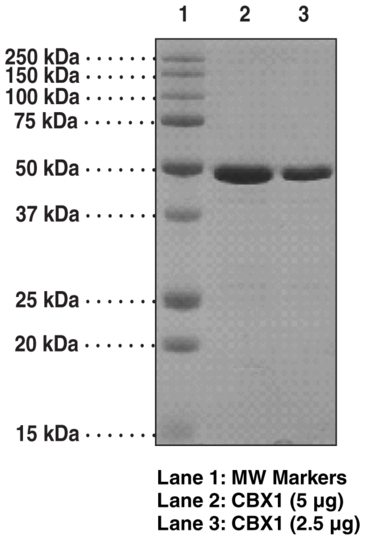 Customer review for "CBX1 (human recombinant)"
Log in or register to review a product. Save 10€ on Your Next Order! Subscribe to the free Biomol newsletter and receive updates on research tools and offers from Biomol. Please note that our products are for research use only and cannot be delivered to private persons and addresses, but only to authorized institutions and businesses. Free shipping and coolant for online orders over 500€ within Germany.